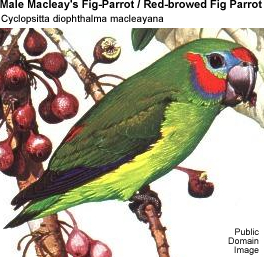 The Macleay's Fig-Parrots, Red-browed Fig-Parrots or Red-browed Double-eyed Fig Parrot (Cyclopsitta diophthalma macleayana) is found in good numbers in coastal Australia of Northern Queensland - specifically its range stretches from Cooktown to Paluma in the north. They are usually seen in pairs or in a flock of a few individuals. They tend to fly in a quick and direct manner. Their eggs are laid in holes in dead trees. The plumage is generally green. Both sexes have a red forehead, but the males also have a red cheek patch, while the females' are usually yellow. 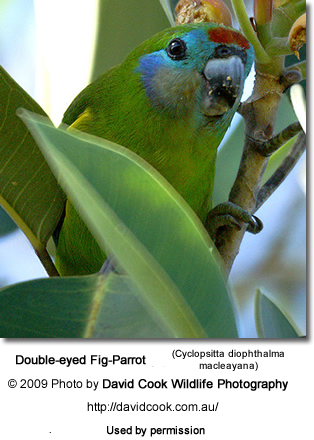 Double-eyed, Blue-faced or Coxen's Fig Parrots (Cyclopsitta diophthalma coxeni): They look alike; except the Coxen's fig parrots has blue brows, whereas the red-browed has red brows (thus its name).